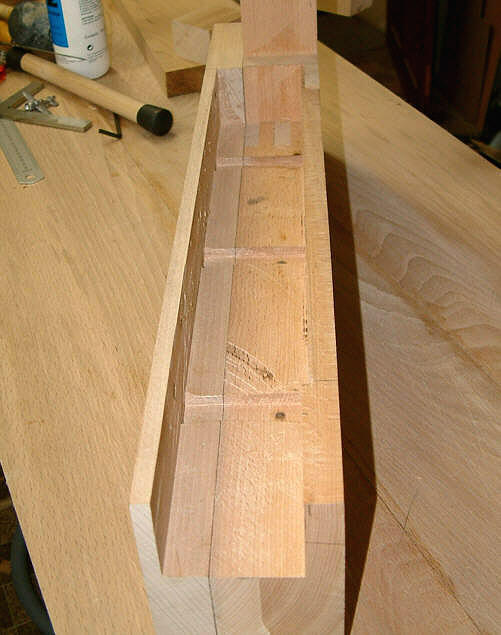 Charles is in the process of building this workbench, but at the time of this posting, has hit a snag in the work and has not quite finished. 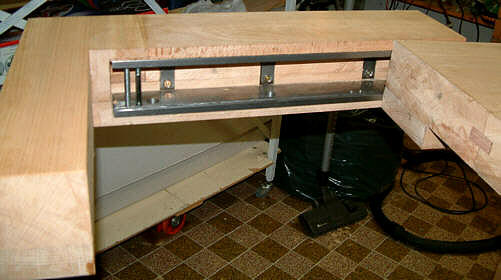 As with so many other work benches the problem has been building the tail vice. We spoke together about the problem, and as a result, he sent me these photos, for which I thank him. I hope that they can help others over the difficulties of assembling a tail vise. 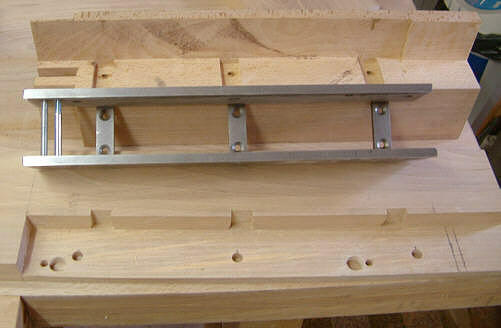 The wooden pieces and metal housing that will make up the moving part of the vice. The pieces of wood for the L-form tail vice assembly before gluing. And from yet another side. The metal track sits in the piece like this. 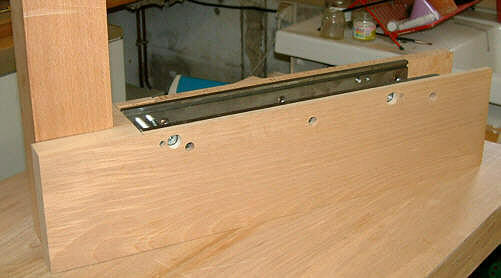 In this view, one can see that the tail vice is built of four pieces of wood, and so the metal housing cannot be seen from underneath. From a functional point of view, this is not important, but Charles didn't want to see the metal. 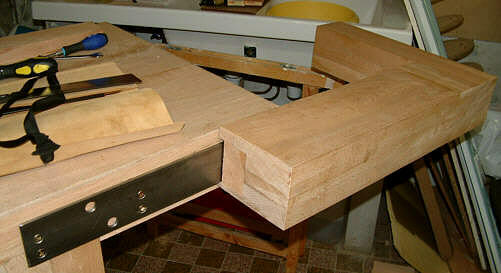 To mount the piece on the work bench, the metal housing must be removed from the wooden assembly. The metal housing is pushed just a few centimeters onto the flat guide plate. 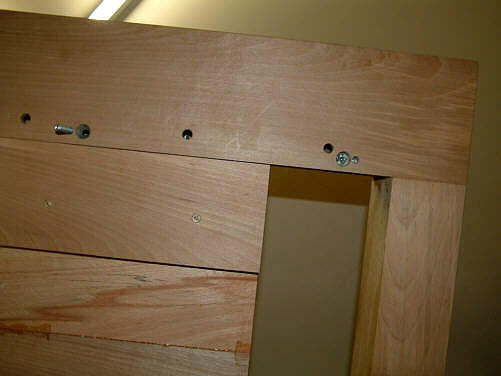 This is the right position for screwing the wood assembly onto the metal housing. 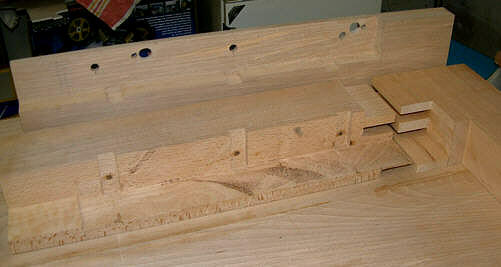 The wood assembly has been mounted on the housing: the view from behind the workbench. Now one can tighten the screws from behind. This is the point at which most people have problems. But if one follows the sequence above, one will have no problems. Like above, but from another perspective. All this might seem a little pedantic, but it is the only way to be able to tighten the screws. 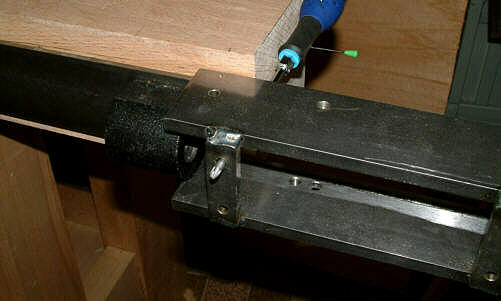 Another bit of advice: if one also plans to cover the bottom of the tail vice with wood, one must also cut holes for access to the fine adjustment screws. A full look at the not-quite-finished bench. Many thanks again to Charles for the photos. 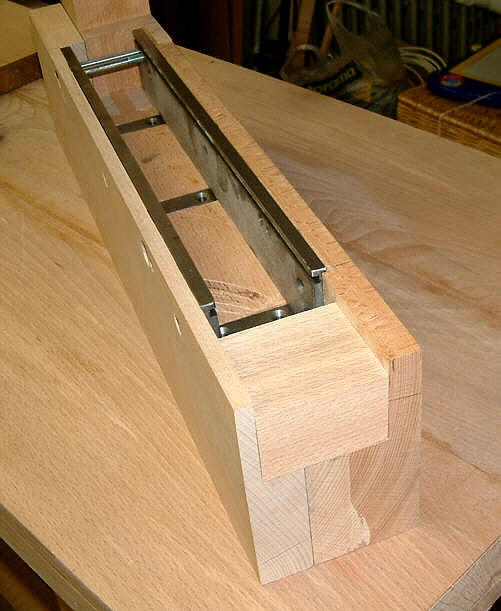 You are here: Homepage → Workshop Equipment → Front Vises, Tail Vises, Screw Spindles → Workbench build by Charles V.